Has your child been suffering from bouts of hot flushes, overheating or fevers? Or perhaps you’ve experienced hot flushes and night sweats yourself? Keep cool with Chilly Towel – a unique towel which retains water while staying dry, to provide a cooling relief for hours. It’s made up of hyper-evaporative fibres and becomes cooler than ambient air when wet, allowing the towel to maintain a low temperature that feels cool to the skin. 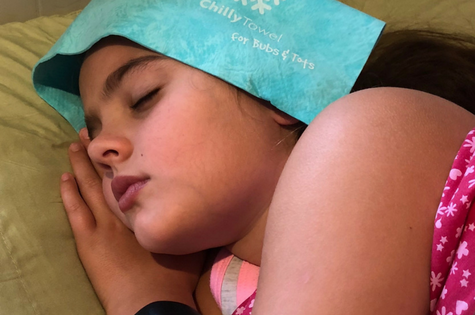 Available in sizes for adults and children – Chilly Towel is the perfect way to keep you and your family recover from hot flushes or night sweats, to feel cool and refreshed. It’s reusable and machine washable, and stays fresh when it’s stored in its packaging. Chilly Towel is available in a variety of colours for adults for $27.50, and in a smaller size for bubs and tots at $24.50. For more information or to purchase, visit www.chillytowel.com.au.